Espirito Santo Aquamarine (Rnd), Natural Cambodian Zircon Stud Earrings (with Push Back) in Platinum Overlay Sterling Silver 1.860 Ct.
Espirito Santo Aquamarine (Pear), Natural Cambodian Zircon Earrings (with Push Back) in Platinum Overlay Sterling Silver 1.750 Ct.
Gemstone earrings have a beauty to allure minds right from the first glimpse. Call it the unparalleled charm of the gemstone that sits on it or simply the intricate detailing of the piece in particular. Aquamarine is one such gemstone that derives its name from the Latin word seawater. The oceanic blue hued stone varies from deep blue to bluish green colour exhibiting a true marvel. Aquamarine is a March birthstone that holds the good points to increase happiness in marriages and having some real healing powers. Apart from its remarkable beauty and benefits, the jewellery so made in this gemstone let the wearer dwell into the sea of tranquil, serenity and calmness. At TJC you will find some immaculate and breathtaking designs in aquamarine earrings, all set to roll your senses. 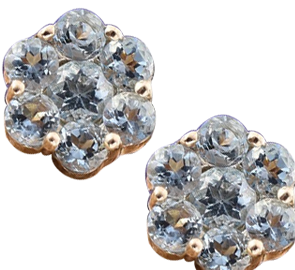 From a pool of wide array of aquamarine earrings in the UK, you are sure to land up finding the most stunning designs with best of craftsmanship here. With florals, halo shaped or drop earrings, the majestic appeal of earrings set in sterling silver, gold or platinum with gold or platinum overlay calls out for some mind blowing gaze. Aquamarine drop earrings are all the rage as they define the enigmatic beauty of the earrings beautifully and empower the wearer for some dazzle. The entire assemblage of aquamarine and diamond earrings has an edge to define sheer serenity of the piece in an account to the beautiful colour of the gemstone itself. So, get ready to find some gorgeous pieces and welcome them in your closet defining elegance at par. Aquamarine jewellery certainly complements your spring and summer looks adding on the required pinch of glam. It’s all on you to take the refreshing plunge of some fresh hued jewellery carrying the tag of being a classic heirloom for the ages to come.